Meet Grace Baxter, the daughter of a policeman in a small Shropshire village. It's 1941 in England, and the Blitz is hitting hard. Now that women are filling jobs that were previously for men only, Grace has moved to the Northeastern town of Newcastle-on-Tyne to become an official member of the constabulary. She's eager to learn her job and explore her new home. With a superior who is anti-women in the police and work force in general, she is put to work investigating the murder of a young woman whose body was found among the local ruins of an old Roman temple. The woman had no identification on her, and of course, between the blackout curtains, the constant threat of being bombed, and the body numbing cold of the winter cold, no one in the neighborhood saw or heard anything. As Grace meets more of her neighbors, the suspect pool continues to expand until another murder occurs and her roommate, Mavis, is implicated. With Newcastle being an important coal mining and ship building port, the bombing raids are frequent, forcing the neighbors to spend nights in St. Mary's church crypt. Grace finds herself investigating Mavis and her blond Dutchman friend, a neighbor man who practices arcane rituals and a juvenile delinquent who hates the Germans because of his brother's death while serving in the army. Grace also discovers that the black market in rationed food is going strong in the neighborhood. Is there really anyone she can trust, including her superiors? As the sirens wail in the night air, everyone rushes to the church, but no one is there to let them in. Then the church takes a direct hit and in the ensuing events Grace discovers the truth about the murders, the black marketeers, Mavis and her blond Dutchman, the juvenile delinquent, and her superiors! This is the second book featuring Grace and the first in this location. I intend to go back and read the first book that set Grace on her current path in life. The first book, The Guardian Stones, is set in Grace's home of Noddweir, Shropshire. The characters in Ruined Stones are well drawn and quite realistic. The World War II setting was quite compelling and pulled you into the heart of the story very quickly. I found this to be a dark and brooding setting that really highlighted the twisted story line. A mystery with dark and dangerous undercurrents that will keep you turning the pages. A "Must Read" for any serious fan of historical mysteries. 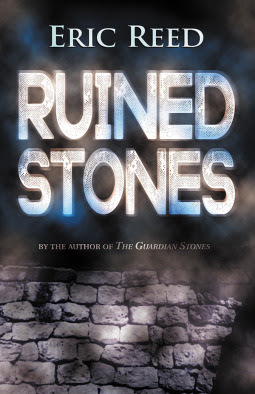 To enter to win a copy of Ruined Stones, simply email KRL at krlcontests@gmail[dot]com by replacing the [dot] with a period, and with the subject line “ruined,” or comment on this article. A winner will be chosen August 19, 2017. U.S. residents only. If entering via email please included your mailing address. Sounds like an amazing read. Great review of the book. Looking forward to reading.